My Company is based on three basic tenets, sound advice, thorough research and successful negotiations. After years of experience in the tenant representation industry, and countless office space leasing transactions in the Los Angeles area, we have found that these three keys are the foundations and primary reasons that our clients keep coming back again for their office space needs.. True value in the office leasing and commercial real estate industry comes in the form of professionals who can clearly understand client's office space needs along with their business needs. The strength that our company brings to each and every client is our knowledge of landlords’ business practices and financial bottom lines. Using this knowledge, our office brokers can advise our clients in creating a negotiating strategy which will be an effective and money-saving real estate solutions. Everyone knows that a solid client relationships will keep clients coming back, and in our highly competitive industry as a Los Angeles office tenant representative, it is rare when a brokerage firm can attest to a client roster that is more repeat business than not. Our company is proud of that track record of repeat and referral-based business. Our reputation has been built on trust, and client centric flexibility, and we back it up with consistent and quantifiable success. 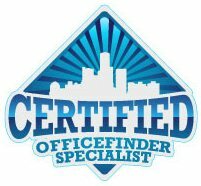 If you are looking for office space in Los Angeles, or the surrounding areas, please contact us today!